After Wildfires Sonoma County Sees Increase In Homelessness – Will Butte County Too? 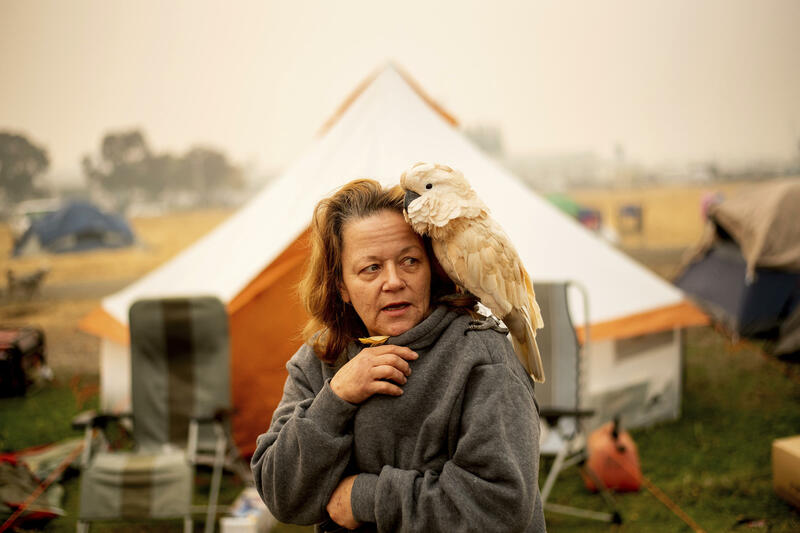 Suzanne Kaksonen, an evacuee of the Camp Fire, and her cockatoo Buddy camp at a makeshift shelter outside a Walmart in Chico, Calif., on Wed, Nov. 14. Kaksonen lost her Paradise home in the blaze. Impassioned discussions at Monday’s Town of Paradise council meeting weren’t the only to take place this week. Tuesday night’s Chico City Council meeting also got heated. One of the most contentious issues–homelessness. The exact number of people living in Chico’s streets isn’t known. Nor is the number of people homeless due to the Camp Fire. It’s a survey required by the U.S. Department of Urban Development and helps determine how much aid the county receives to address homelessness. This year though the fire caused the count to be postponed until March. Other counties across the nation were able to take their counts last month though, including Sonoma County, where in 2017 wildfires ravaged the City of Santa Rosa killing 22 people and destroying more than 4,600 homes. KRCB’s Adia White reports that the 2017 wildfires have only made an existing problem worse.